Their relationship in future games? Where do you see these two heading in their relationship in the future games? In the Secret Ending, Sora and Kairi talk, and Sora says that there's still one more thing for him to do. Kairi smiles and gives him her lucky charm back again. Re: Their relationship in future games? Most likely, Kairi will end up following Sora and Riku where ever they go, even if they intend for her to stay home. ^ That's probably true, Wanta. Just hope it doesn't turn out, or come across as a rehash of her part in KH2. Kairi is a useful character. She could play so many different parts now that she has a keyblade. I don't think that they will pass over that opportunity. WantaSoraplushie wrote: Kairi is a useful character. She could play so many different parts now that she has a keyblade. I don't think that they will pass over that opportunity. Actually, I have to disagree with you on this; Kairi has the potential to be a useful character. And a keyblade =/= useful character. That said, she'll inevitably get one in the future. For Kairi as a character, I want to see her act more as the emotional support for Sora and Riku, sorta like Winry does for Ed and Al in Fullmetal Alchemist. 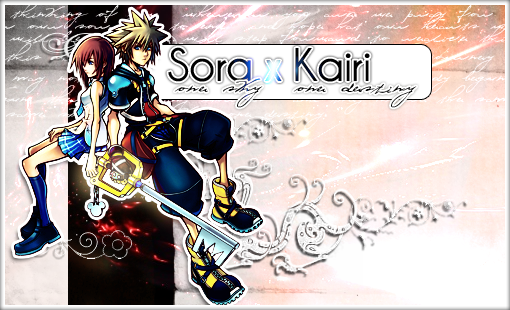 That said, as a Keybearer, I want Kairi to be light-based in her tactics. As a writer, I would be ashamed of Nomura if he didn't use Kairi to her full potential. I agree 100%, however, try telling that to the Kairi haters. What an unfathomable lot. However, now that Kairi has a keyblade, she might as well use it. WantaSoraplushie wrote: I agree 100%, however, try telling that to the Kairi haters. What an unfathomable lot. However, now that Kairi has a keyblade, she might as well use it. Actually, it was the Kairi Haters that got me thinking more like this. Some will always hate Kairi, but others are more open to the idea of Kairi becoming a better character in future games. If anything, I'd say the people with the naive train of thought are a small minority of the Kairi fandom. And technically she doesn't have the keyblade, it was Riku's after all, but she does have the potential to wield one in the future. VirgilTheart wrote: And technically she doesn't have the keyblade, it was Riku's after all, but she does have the potential to wield one in the future. Frankly, I'm starting do disagree with that train of thought. It seems to me to be something that KHI thought up on it's own, and decided was canon. After all, it wasn't a coincidence that the Keyblade Riku gave Kairi was the Aqua's. I think that Keyblade really is hers, even though it came to her by unusual means. Until someone shows me the press release that proves that theory wrong, along with the one about families not being relevant, because it's really starting to seem like Riku is related to Master Xehanort, I'm sticking by it. ... not to be confrontational or anything. If you disagree with me, that's fine. As I recall, Nomura stated that it was Riku's keyblade in the KH2 Ultimania, but I'd need to check. And really, for Aqua it was a keychain, not a keyblade. Yes, the weapon represents Kairi, but as for whether or not it's her weapon isn't definite yet. As for Riku being related to Master Xehanort, I have to agree with you, but then again, a good number of fans thought Ven might've been Sora's older brother. We'll just have to wait and see. I think Riku being related to Master Xehanort would add so much depth to his character, but if you tried to mention that theory over at the KHInsider forums you would be jumped on and ripped to peices. Meh, it depends on how they played it out, to be honest. True! Anyways I'm hoping that we at least get much more from Kairi in the next arc, since it seems she probably won't play too big a role in the Xehanort Arc. Nah, Nomura's said that there IS an ending to the series before. Part of me suspects the next arc will be the last one, but if not, it'll probably end with a third arc. Besides, I want to see Nomura go into the concept of corrupted light at some point. I don't. Not really. It seems just as cliche as darkness as a a villain to me, and Kingdom Hearts can only take so many cliches.